All of our tubing projects begin with quality steel or aluminum tubing that is cleaned and cut to size. The tubing is then pieced together on tables and welded into place. Our finish of choice is the “electrostatic” paint finish. A two-coat, anti-rust epoxy primer is applied first and then a two-coat, epoxy paint is applied using a hand spray gun that is grounded to attract to the panel for a more complete coverage. Because this finish is applied wet, it is easy to touch-up later, unlike a baked on or “powdercoat” finish. However, we do offer a powdercoat finish if requested. We install all types of vinyl fencing and gates including rail style and privacy. 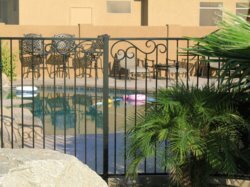 We install all types of chain link fencing and gates from residential grade to commercial grade. 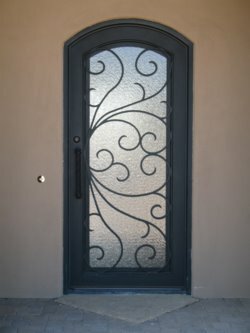 We install automation packages on new or existing gates from simple remote in / remote out set-ups to full automation with calling units and keypads. You can call (480)507-7479 or use our convenient Contact Us page.